This astronaut has a big smile after his 1963 orbit mission in Faith 7. 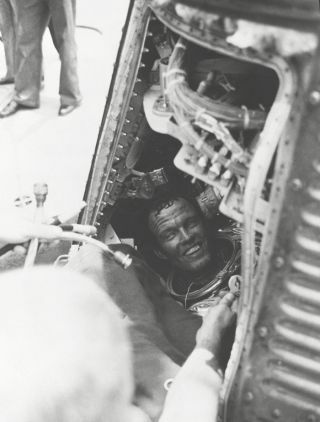 In this historical photo from the U.S. space agency, Astronaut L. Gordon Cooper Jr., has a smile for the recovery crew of the U.S.S. Kearsarge, after he is on board from a successful 22 orbit mission of the Earth in his Mercury spacecraft "Faith 7." Cooper is still sitting in his capsule, with his helmet off.